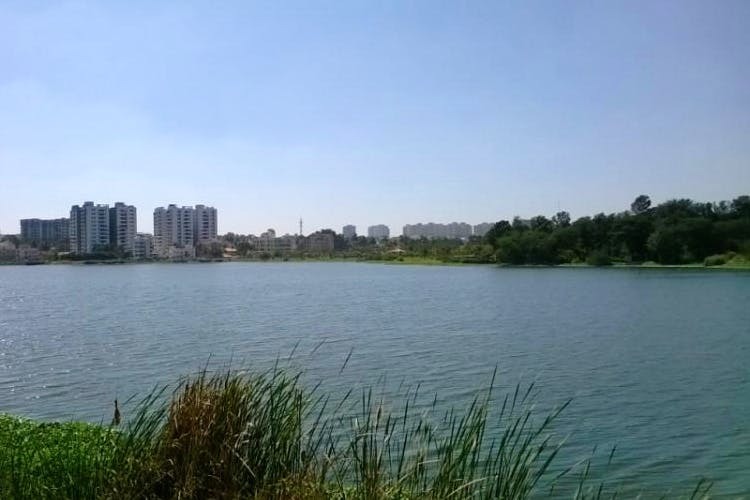 A little known North Bangalore gem, Rachenahalli Lake Park is a green oasis built around an expansive lake. Chill out here with your tiny tots or exercise those glutes during a morning run. Need a breather from the hustle and bustle of the city without wandering too far away? Head straight to the Rachenahalli Lake that’s a short drive away from Nagawara. Following Google Maps will get you there easily, however, we recommend you drive down there or take a taxi since autos are pretty scarce. Popular with the local residents, this place is perfect for when you want to do some soul searching under a tree or to enjoy the cool, summer breeze by an expansive lake that’s surrounded by city scrapers. The park is equipped with running tracks surrounded by the lush lawns. The best time to stop by is during an early morning or during a sunset. You’ll join scores of aunties, senior citizens, and young guns taking laps of the park. There’s also a little gymnasium (a common feature in parks these days) where you can try out a few contraptions to get into shape. Plan a fun day for the kids here. The park is equipped with a play area for the tiny tots that they seem to love. Here they can swing off monkey bars and see-saw and glide down slides. You can also play a game of cricket or catch around the lawns.While the lake has been gated in, there is a small jetty from where you can watch birds or take cool selfies from. However, do note that pets and eatables are not allowed in so you may want take the picnic basket elsewhere. If your kids are still in the party mood, you may want to stop by the nearby Lumbini Gardens for an extra dose of fun.